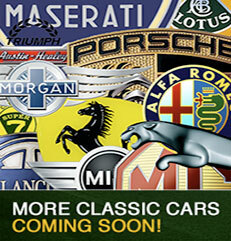 At Cross Channel Sports Cars we specialise in sourcing and selling quality classic sports cars. All our cars are carefully checked and prepared and offered for sale complete with french immatriculation. We specialise in classic British marques, including such famous names as; MG, Triumph, Lotus, Morris, Austin, Austin Healey and Jaguar to name just a few and we only add vehicles to our portfolio that meet our own high standards and specifications. We have a wealth of experience with the iconic British sports car marque ‘Morgan’, having helped numerous clients from all over France acquire their very first Morgan. We are also proud to be the representatives in France for ‘Williams Automobiles’ who are the largest Morgan dealership in the UK. As professional members of the F.F.V.E. (Fédération Française des Véhicules d'Epoque) we can help you to register your vehicle in France, taking care of all paperwork and processes. Our experience in registering 'collection' sports and classic cars over 30 years old and even complex 'non conformity' marques, means we can save you a great deal of time and money in your quest to own your dream car in France. So if you are interested in buying one of our classic cars or need help with your existing classic car here in France, then please call +33 (0)5 63 94 58 31 or click here to send an email.